Mabamba Bay is a wetland on the edge of Lake Victoria, northwest of the Entebbe peninsula. 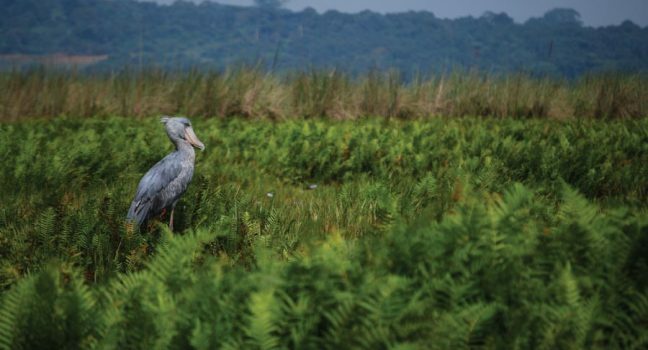 Mabamba is one of Uganda’s 33 Important Bird Areas and since 2006 a Ramsar-listed wetland of international importance Key protected bird species in Mabamba are the shoebill, the blue swallow and the papyrus gonolek. Mabamba Bay is a unique extensive marsh stretching along a narrow bay, fringed with papyrus towards the main body of Lake Victoria. Lying between Busi Island and Buwaya/Zziba village on the mainland, this marshland forms part of Buwaya Bay, South-west of Nakiwogo Bay both of which are located west of Entebbe International Airport. For Mabamba Birding, We shall set off after an early breakfast with a packed lunch and travel to Mabamba Swamp to spot the rare shoebill. The journey takes about an hour by road via Nakawuka-Kasanje. The wetland is home to a variety of bird species and birding will take us a whole day. A canoe ride through papyrus swamp will take you at the best spot of spotting the Shoebill bird among other rare Africa birds like the Malachite Kingfisher, Swamp Flycatchers, African Purple Swamphen, African Water Rail, Common Moorhen, Lesse Jacana, African Jacana, African Pygime Goose, White faced whistling duck,, Squacco heron, Blue reasted Bee eater, African Jacana, and Saddle – billed Stork, among others. We shall return to you’ Hotel in the late afternoon.